Recombinant full length protein corresponding to Mouse CD31. Our Abpromise guarantee covers the use of ab119341 in the following tested applications. ab18474 - Armenian Hamster monoclonal IgG, is suitable for use as an isotype control with this antibody. 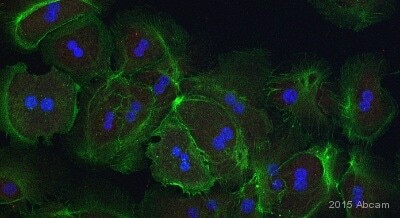 Immunocytochemistry/ Immunofluorescence - Anti-CD31 antibody [2H8] (ab119341)This image is courtesy of an anonymous abreview. ab119341 staining CD31 in mouse hepatocyte cells by ICC/IF (Immunocytochemistry/immunofluorescence). Cells were fixed with paraformaldehyde, permeabilized with 0.1% Triton X-100 and blocked with 2% BSA for 60 minutes at 23°C. Samples were incubated with primary antibody (1/250) for 16 hours at 4°C. A goat anti-hamster (Armenian) was used as the secondary antibody at a dilution of 1/250. Flow cytometry analysis of CD31 in mouse splenocytes (green) compared to an isotype control (blue). Human blood was collected, combined with a hydrophilic polysaccharide, centrifuged, transferred to a conical tube and washed with PBS. 50 ul of cell solution was added to each tube at a dilution of 2x10^7 cells/ml, followed by the addition of 50 ul of isotype control and primary antibody (ab119341) at a dilution of 0.5 ug/test. Cells were incubated for 30 min at 4ºC and washed with a cell buffer, followed by incubation with a DyLight 488-conjugated secondary antibody for 30 min at 4ºC in the dark. FACS analysis was performed using 400 ul of cell buffer. Flow cytometry analysis of CD31 in HUVEC cells (green) compared to an isotype control (blue). Cells were harvested, adjusted to a concentration of 1-5x10^6 cells/ml, fixed with 2% paraformaldehyde and washed with PBS. Cells were blocked with a 2% solution of BSA-PBS for 30 min at room temperature and incubated with a CD31 monoclonal antibody (Proab119341) at a dilution of 0.5 ug/test for 60 min at room temperature. Cells were then incubated for 40 min at room temperature in the dark using a Dylight 488-conjugated secondary antibody and re-suspended in PBS for FACS analysis. Publishing research using ab119341? Please let us know so that we can cite the reference in this datasheet.